You pull into your driveway and the strangest thing happens. Your car dips into the pavement. Whether the reason is a pothole, large cracks, or sinkholes, this will not be a fast fix. And if you don’t do something about it fast, it could get worse. Before you can start to fix a driveway, you have to look for what parts you’ll need to address. This will help you figure out what materials you’ll need to get started. Potholes are caused by the movement of groundwater underneath the pavement. After this water freezes or moves and extreme pressure is put on the pavement by cars, the material eventually erodes. As a result, it leaves a hole in the ground. If your driveway looks like it has a bunch of vine-like cracks in it, this is also a sign it needs to be fixed. Although the cracks may look small, they may cause a lot of damage. If they’re larger, you will need more material and time to fix them. You can identify sinkholes by looking for parts of the driveway that are dipping or sinking into the ground. These are also caused by water movement underneath the pavement as well as heat from the sun. These are usually fixed by using patches. Get ready to fix a driveway by making sure that the area is prepped for the repair. Wear clothes that you don’t mind getting dirty and remove everything from your driveway, such as cars. Use a broom or a pressure washer to clean off any dirt from the entire area. Make sure your driveway is completely dry before starting any of the work. If you notice any weed or grass that has been growing in between the cracks, remove those as well. These materials and accessories will help in repairing many different driveway damages. Depending on what you will be fixing, you may not need all of them. 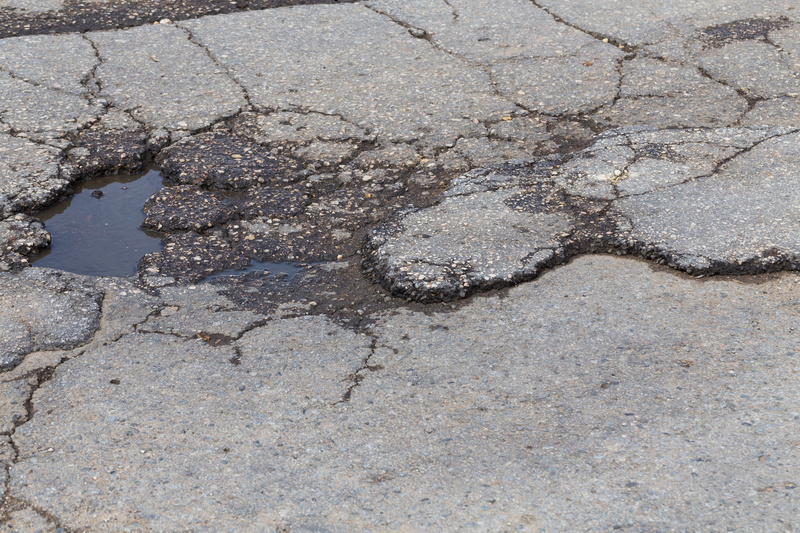 For a pothole that isn’t very deep, chances are you’ll just need to use an asphalt patch to cover it up. If the pothole is very deep and goes beyond the first layer of asphalt, then you will want to fill it with gravel first. Leave about four inches of the hole left and then put the patch on it. For cracks in the pavement, pour an asphalt patch into the cracks. Make sure you are generous with this patch and that it covers the cracks completely. Then use a squeegee to smooth out the area of the cracks. If the sinkhole isn’t too deep (under two inches), use an asphalt patch to repair it. If the sinkhole is deeper than that, take out the asphalt inside of it. Then fix it just like a pothole. When you start to fix the driveway, you might feel like you’re way over your head. But with the proper directions, you will be able to DIY your way to perfection! For more tips for all of your stay at home projects, check out our blog!